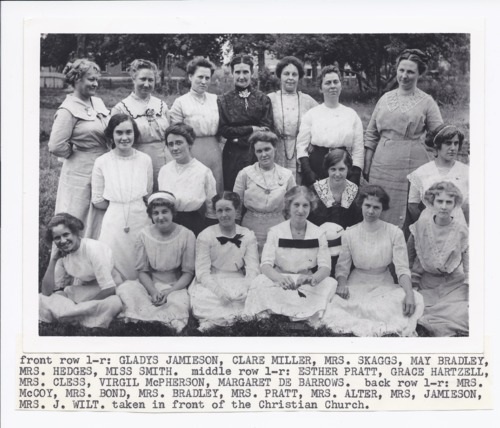 Ladies of the chorale group pictured left to right are: front row, Gladys Jamieson, Clare Miller, Mrs. Skaggs, May Bradley, Mrs. Hedges, and Miss Smith; middle row, Esther Pratt, Grace Hartzell, Mrs. Cless, Virgil McPherson, and Margaret DeBarrows; back row, Mrs. McCoy, Mrs. Bond, Mrs. Bradley, Mrs. Pratt, Mrs. Alter, Mrs. Jamieson, and Mrs. J. Wilt. The picture was taken in front of the Christian Church in Rossville, Kansas. This photograph is provided through a pilot project to host unique cultural heritage materials from local libraries on Kansas Memory and was accomplished by mutual agreement between the Northeast Kansas Library System, the Rossville Community Library, and the Kansas Historical Society.